It’s been a mostly cold, wet spring here. 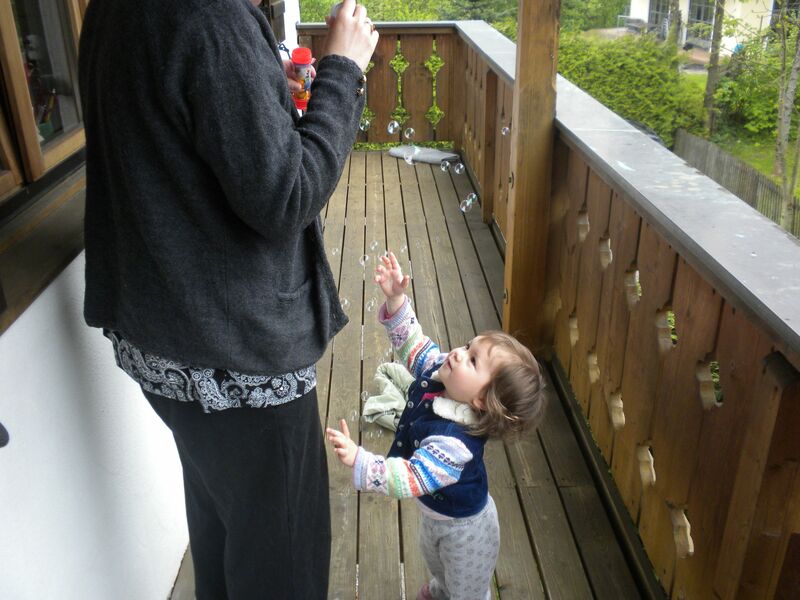 Fortunately, our balconies are well-protected so Rosebud and I could still go outside and blow bubbles in the rain. When you have a toddler, it’s nice to have an outdoors activity you can do when it’s raining, as it was on this day. 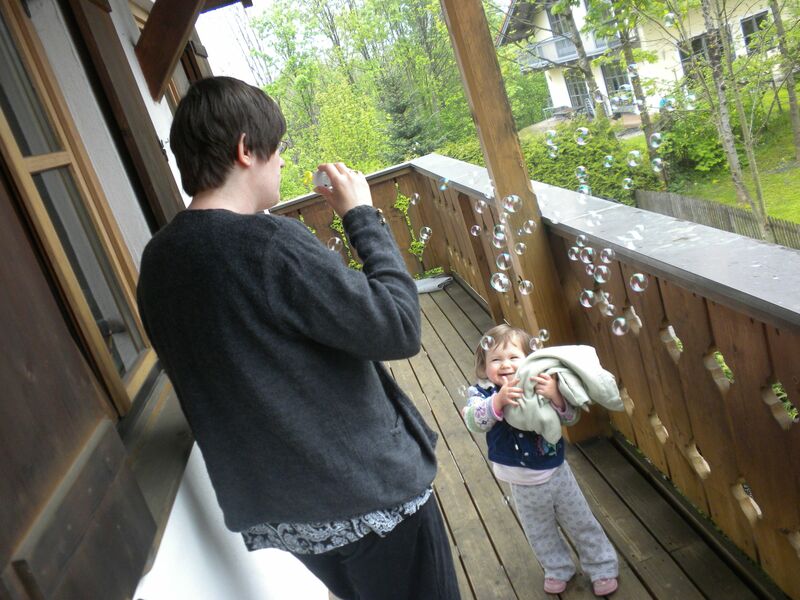 This entry was posted in Kids and tagged blowing bubbles, kids' activities, toddlers. Bookmark the permalink. I tried blowing bubbles with my girl last summer and she was more interested in playing with dirt. 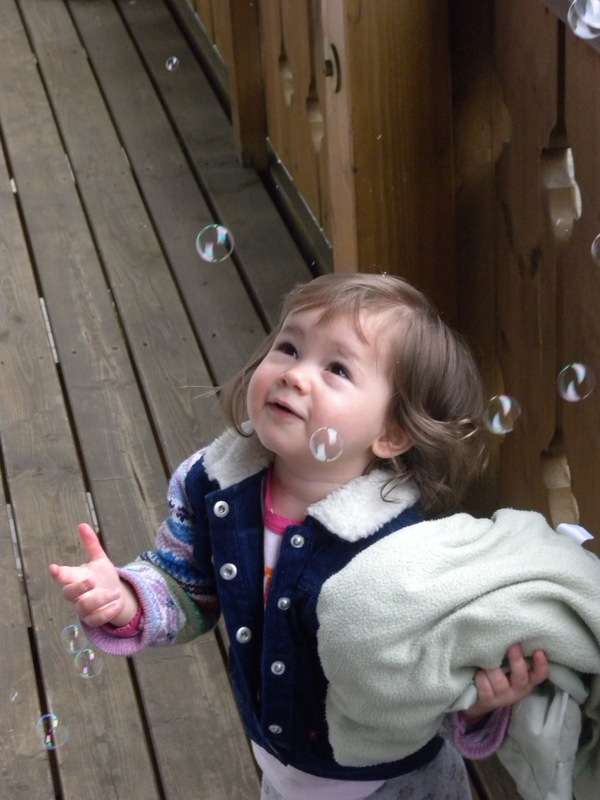 I might have to get the bubbles back out this year and see if she likes them now. 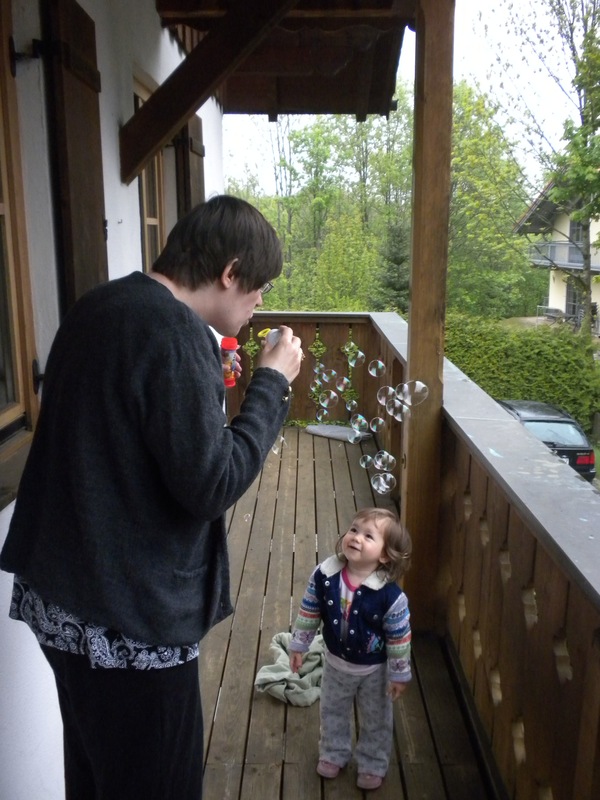 We tried bubbles with Rosebud last fall, when she was around 18 months old, and she didn’t really “get” bubbles – so definitely try them again with your daughter. On that note, it’s been interesting to see what Rosebud suddenly comprehends and what she likes at age two as compared to 18 months. The cognitive development in just a short six months is amazing; I mean, it just astounds me by how quickly she’s learning and progressing. We've tried bubbles with Stella and all she cares about is trying to get the wand so she can chew on it. We've made progress from being terrified of the bubbles, but that's probably because the first time we tried them, a big juicy one popped right in her eye. Just another awesome parenting moment to add to my list! Oh no!!! *giggle* I think the awesome parenting moments are essential, you know. It keeps things real… right, RIGHT? lol. That’s what I keep telling myself, anyway. I’d say that Stella might be ready to try bubbles again later in the summer. I can’t remember – is she walking yet? I think being able to chase after the bubbles is a big enticement for Rosebud! LOL, we keep it VERY real! You can take the girl out of Germany, but you can’t take Germany out of the girl.